We are visualizing and seeing a creation of our own desires, nothing else. And “me” is the dreamer of those dreams, the creator of that creation. 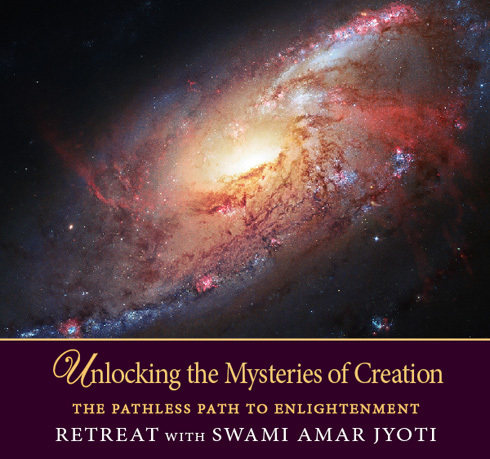 In this First Annual Spiritual Retreat, given at Sacred Mountain Ashram in 1976, Swami Amar Jyoti brings the living waters of Truth into our lives. He reveals the importance of spiritual practices, and how to deserve and rightly use what we are given so that our meditations open us to divine bliss. When we become a child before Mother Nature, She reveals Her true meaning. With sincerity and devotion we grow from ego to egolessness, from third to fourth dimensional consciousness. Ultimately we realize the secret of creation, the climax of Vedanta, the pathless path to Enlightenment.